Mellisandra has a shady past as a pirate and smuggler, but the DGB are willing to overlook it considering the entertainment value of her reckless plays and last-minute dashes. Riller is the smallest player to make it as an MVP, but as he says, size doesn’t matter when you play dirty! His inventive fouls and relentless self-promotion have made him a firm fan favourite. The Praetorian is a surprisingly well-rounded player, a heavily-armoured Striker who uses a high-tech Charge Glove to handle the ball. His origins are shrouded in mystery, but his fans don’t care! 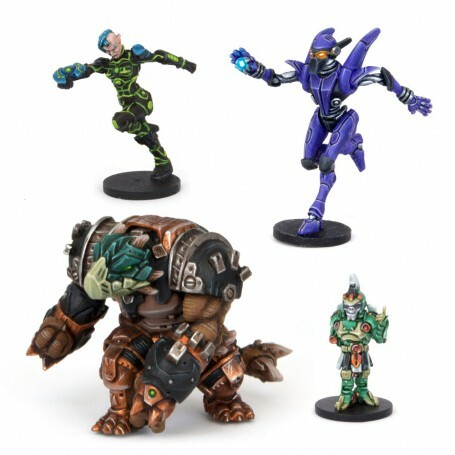 Dozer is one of the few female Teratons to grace a DreadBall arena. Her natural size gives her a distinct advantage over her male counterparts – one she’s not afraid to put to use.